Beginning Memorial Day weekend in May, Disney’s Animal Kingdom becomes a full-day park. It’s exploding with tons of new shows, events and things to do at night. Take a look at the new nighttime offerings coming to Animal Kingdom. 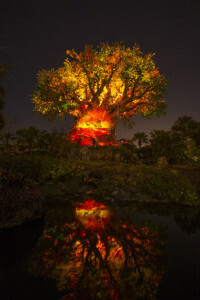 The Tree of Life Awakens The theme park’s iconic Tree of Life will undergo extraordinary “awakenings” throughout the evening as the animal spirits are brought to life by magical fireflies that reveal colorful stories of wonder and enchantment. High-tech projections of nature scenes take on a magical quality as they appear to dramatically emanate from within the Tree of Life. Kilimanjaro Safaris after Dark Each evening, the popular Kilimanjaro Safaris daytime experience is artfully bathed in the glow of sunset with special lighting allowing guests to explore this attraction well into the night. During the expedition, guests can now encounter the nighttime behavior of the wildlife and better tune in to the unique vocalization of the animals. Plus, there are two new species to discover: African wild dogs and hyenas. The Jungle Book: Alive with Magic For the summer, Discovery River becomes the stage for music and pageantry in a limited-engagement show inspired by Disney’s hit live-action film The Jungle Book. The Jungle Book: Alive with Magic is a live show filled with music and special effects that celebrates the new film and the classic songs, now infused with an Indian influence. Harambe Wildlife Parti When the sun sets, the popular Village of Harambe will become a hot spot with the new Harambe Wildlife Parti. Here, “party animals” can dance alongside a variety of entertainers and local street musicians, and enjoy the lively rhythms of African music. Guests can also partake in exotic foods and libations, and explore the diverse wares of village artisans and merchants in the vibrant marketplace. Discovery Island Carnivale The spirited community of Discovery Island has come together to celebrate their love of the natural world with the Discovery Island Carnivale. 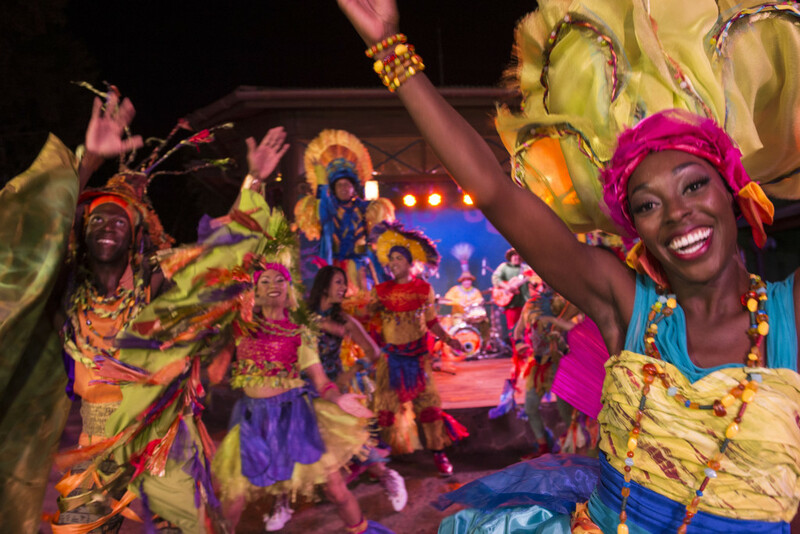 This nightly experience will captivate guests with lively music, jubilant dance, vibrant costumes, stilt walkers and tasty culinary creations — winding from one end of the island to the other. Tiffins Signature Restaurant In addition to the diverse new entertainment offerings, guests will enjoy Disney’s Animal Kingdom’s new signature eatery, Tiffins. Open for both lunch and dinner, this new signature dining experience will celebrate the art of traveling and include waterfront views from both indoor and outdoor seating areas. “Tiffin” is an Indian English word meaning midday meal or type of container used to carry food while traveling. New Adventures with Favorite Attractions Most attractions remain open at nightfall, and will shine like never before. 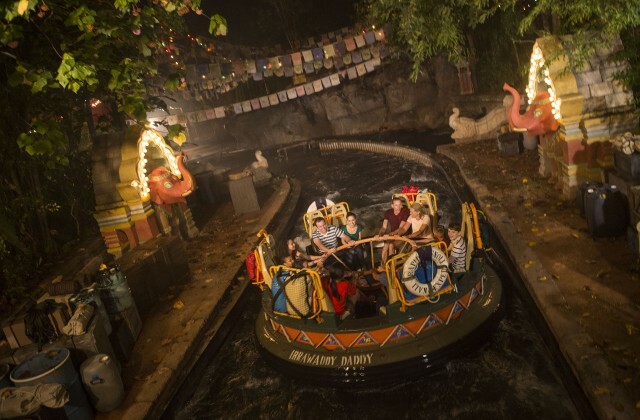 At sundown, Kali River Rapids will reveal mysterious twists and turns throughout the rainforest with dramatic and drenching fun. Expedition Everest thrills adventurers as it lurches forward and backward through the icy peaks of the Himalayas. At night, the majestic mountain challenges trekkers to an evening ride revealing breathtaking views of the Animal Kingdom canopied by starlight. Amidst the colorful midway games at Chester & Hester’s Dino-Rama in DinoLand U.S.A., the thrills turn up aboard the zany Triceratop Spin or Primeval Whirl under the lights. 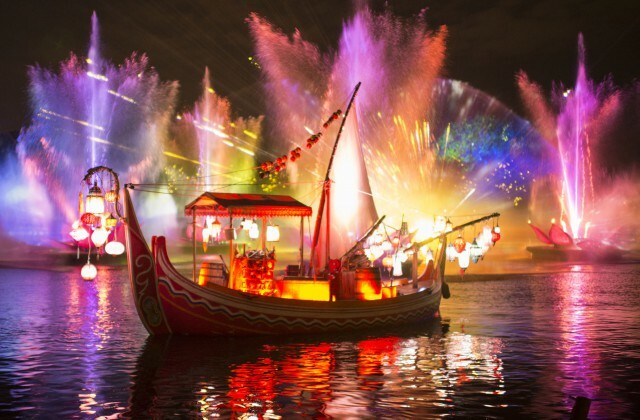 More Magic to Come with “Rivers of Light” The nighttime will grow even more magical with the premiere of the majestic nighttime jewel, “Rivers of Light.” This illuminating musical experience will celebrate the magic of animals, humans and the natural world with a blend of performers, floating lanterns and theatrical animal imagery. Discovery River, Kilimanjaro Safaris, Rivers of Light, The Jungle Book, Tree of Life Awakens. Bookmark.